2. Mix soy sauce, brown sugar, ginger, garlic and green onions in a small sauce pan. 4. 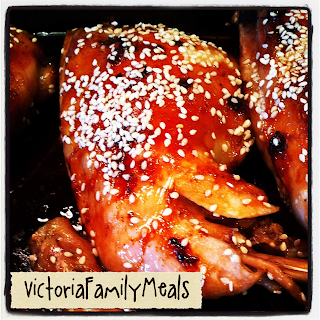 Place chicken legs on a lined bake sheet or roasting pan and pour half of the soy sauce mixture over legs. 5. In 30 minutes turn legs and cover with remaining soy sauce mixture. 6. In another 30 minutes sprinkle with sesame seeds and cook for another 10 minutes. 7. Serve with rice and Asian Grated Carrot Salad. Hi your recipe gives me an idea on how to make a sesame stir fried chicken. Thanks for sharing it here because I'm really sure that your recipe was really delicious.